It is low maintenance and has a longer life span. The setup process is very easy with the provision of a simple-to-read manual. It works well with in-ground vinyl, concrete and fiberglass pools. This cleaner helps in removing debris in corners and steep walls. It can remove small stones, twigs and leaves. Driving mechanism helps the cleaner to fully cover the cleaner. Pressure regulation achieves a constant motion. It collects more dirt in limited time. It comes with 1 year warranty and sold at an attractive price. This cleaner can get stuck if it hits the wall can this can be eliminated by constantly checking the back-pressure valve.The locking mechanism tends to be inconvenient since dirt would spill while unlocking the system. Foam scrubbers get worn out quickly but can be replaced. Front-Wheel and Four Wheel Drive: The front wheel drive provides the chassis with enough power to clean the pool effectively. It also prevents the unit from tipping while cleaning. A four wheel drive ensures that the cleaner covers all sides of the pool. It can climb walls quickly and scrub off any dirt. Suction: Legend LL505G can clean a 30,000 gallon pool within 3 hour with great efficiency. The suction power is capable of removing leaves, seeds and twigs. It can clean pools of different shapes and sizes. Its vacuum tube has a pressure nearly 40 more than ordinary pool cleaners. This cleaner is powered by a different booster pump for maximum performance. 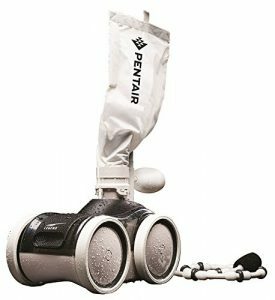 Long Hose: Pentair LL505G comes with a long hose for maximum pool coverage. This hose has a sweep action which removes debris from hard-to-reach corners. Pressure Valve and Large Intake Throat: The pressure valve controls the amount of water pressure while vacuuming the pool. It allows the cleaner to travel at a constant speed to avoid skipping spots. This back up valve activates every 3.5 minutes. This prevents cleaning from stopping at the steps and corners. A large intake throat helps in handling debris of high volume for faster cleaning. Foam Scrubber: This is attached at the back and used to scrub the pool walls and floors thoroughly. This is done gently by sweeping away particles thus leaving your pool crystal clear. Large Bag: The cleaning bag has a relatively high capacity compared to most models. This filter bag can be removed easily for periodic cleaning enabled by the twist-lock design. Water hose can be used to clear fine grit on the bag. A Velcro strap and ring help in keeping the bag vertical to avoid interfering with the cleaning operation. Removing dirt and debris from the bag is also easy. Cruise LED light: Bright lights are also incorporated to help you clean your pool at night, These lights are powered by the internal water turbine. This eliminates the need of making battery replacements. Design and Colors: Legend LL505G comes in a sleek, sporty and technological design. The frame is very light thus making it more easy to carry. It can also be moved easily by water currents. The surface is painted with simple white and grey colors.